This most famous of Rembrandt’s landscapes must also rank as one of the most majestic and deeply evocative representations of the natural world ever committed to paper. Rembrandt made his first landscape etchings around 1640 based on the countryside surrounding Amsterdam. But whereas his drawings were made outdoors in the landscape, his copper plates, which display an unmatched swiftness and spontaneity in the handling of the etching needle, were largely invented and completed in the studio, despite their appearance to the contrary. In The three trees, his largest landscape print, Rembrandt portrays a limitless view of Dutch scenery, dramatically orchestrated with marked contrasts of light and dark and other atmospheric effects. It is an ecstatic celebration of the natural world, vividly depicted in all its changeability and powerful vitality. 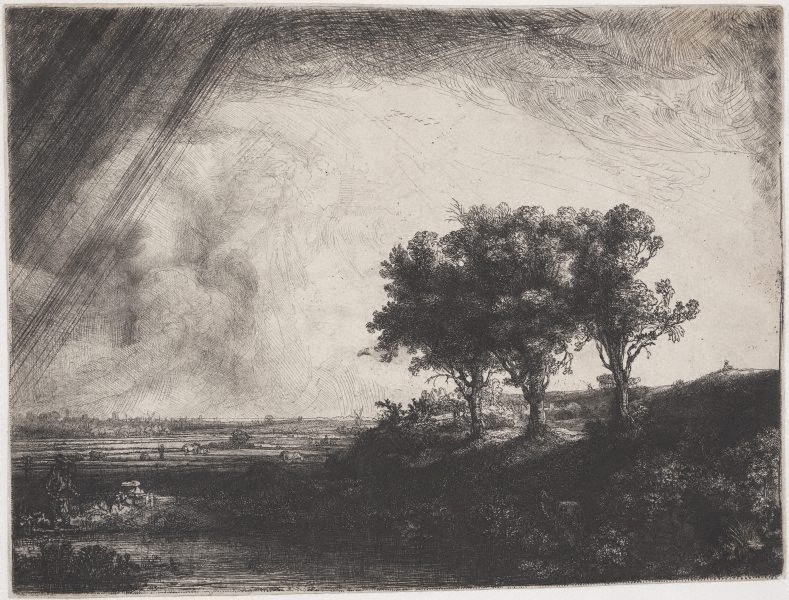 The sky – which so often in Rembrandt’s etchings is featureless – is an essay in meteorological activity: gusts of wind and moisture-laden thunderclouds pass over the landscape, unleashing a downpour of rain on the left, while the entire right side of the composition is suffused in sunlight. Dominating this area and standing out starkly against the burst of light are the three majestic trees, the sturdy trunks of which contrast markedly with the ephemeral conditions. The branches and leaves have grown into each other, forming a single, massive bouquet, and the small bird flying out of the foliage adds an idyllic note. As we look deeper into this vast landscape, we notice that it is also animated by human presence: there are rustic cottages nestled in the patch of light beneath the trees, and on the skyline a cart full with peasants makes its way slowly along. Farther to the right an artist sits sketching; in the lower right, two lovers – barely visible – hide in the shadowy bushes and, on the opposite side, a man, accompanied by his wife, casts a fishing line into a stretch of water. Behind them the vista spreads out across flat meadows and still waterways, which reflect the turbulent mood of the sky and take our eye to the town on the distant horizon. For all its copiousness of naturalistically observed detail and lovingly recorded incident, the landscape as a whole is a poetic invention. By virtue of the overwhelming, almost cosmic, breadth of its vision, The three trees conveys intimations of divine presence in all of the natural order. We do not know whether Rembrandt intended his landscape to have a pantheistic message, but this has not prevented commentators from seeking an underlying, generalised symbolism in the print or, even more specifically, as has often been suggested, from viewing the motif of the trees as an evocation of the three crosses on Calvary. In any case, the print defies any single interpretation and remains a deeply poetic image of inexhaustible significance. Rembrandt’s use of a combination of different techniques in The three trees – etching, drypoint and engraving, as well as plate tone, noticeable at left in the sky – underlines his ambition for this masterpiece with its compelling range of effects. Unusually, however, the print only exists in one state, which is to say that it is impossible for us to know exactly how Rembrandt advanced the plate or to identify the specific stages through which the composition passed before its final resolution. Signed and dated l.l., [incised plate, barely visible] "Rembrandt... 1643". Great collections , Sydney, 2008, col illus p 40. Rembrandt as an etcher: a study of the artist at work , 1999, pp 219-22. Prints & drawings Europe 1500-1900 , Sydney, 2014, col illus pp 18-19, p 60, col illus p 61.